No More Problems with Restrictive and Non-Restrictive Clauses | Want to Be a Freelancer? Join People Doing the Job They Like! Do you agree that restrictive and non-restrictive clauses are one of those tricky cases when a comma means everything? Sometimes it changes the meaning, and sometimes it is a must. It’s pretty simple. When the information is essential, it is a part of the sentence and we don’t separate it from the rest of the sentence. When it is non-essential, we use punctuation for readers’ convenience. As to the sentence discussed above, the right variant is “Bill Clinton, who was a former President, was not a good family man.” The extra information from a non-restrictive clause doesn’t add much value. By the way, do you play a guessing game when choosing between ‘who’ and ‘that’? It’s ok, most people actually do. It is just that some of them think it is embarrassing to admit it openly. In fact, everything is pretty simple. It is always ‘who’ for a person and ‘that’ or ‘which’ for inanimate objects. That’s it. So, everything seems to be clear. 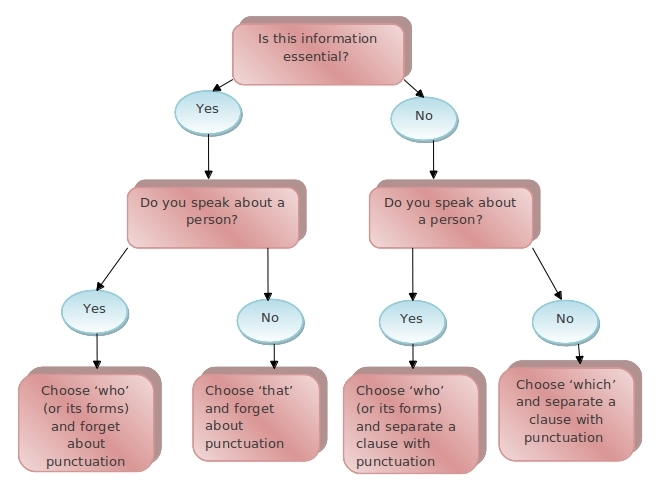 Here I’ve got an algorithm for recognizing restrictive and non-restrictive clauses and making informed decisions. Am I missing something from this algorithm? Please, leave your comments below.